I made a Double pad mod, and it works great! Now, my pads don't slide away from each other during a song. Consider this an add-on to the FAQ at DDRFreak. If you are going to follow these instructions, first read that FAQ. Wood size is 67"x37" (5'7"x3'1"). (Only 66"x36" is needed, but the extra inch really helps when stapling around the edges.) This is easily cut from a 6'x4' board at Home Depot. Get it at least 1/2" thick. Put your two dancepads side-by-side to each other, as close as possible, leaving only a narrow gap for staples. Flatten the pads as best you can. Line up the pads perfectly next to each other. There should just barely be a narrow gap between them. The pads should not go over the edge of the wood (it will be a tight fit, though). Positioning tip: Use small bits of tape to hold one pad to the center of the board. Then, put the other pad on top of the tape, and tape the other pad on top of the first pad. Don't use very much tape or loop the tape over the edge, otherwise it will tear. The thing is held with staples, not with tape. Update 7/2001: If you use cheap wood, it might splinter and impale your dancepads. Protect against this by putting thick clear contact paper (also available at Home Depot) over the top of the wood. Put the pads on top of this protective layer. I didn't do this when building mine, but have had no problems yet, as fairly good particle board was used. Update 1/2006: If you are making this pad from brand-new dancemats, drape them over the back of a couch for a few days, so that the creases fall out. You want to avoid creases in the pads. Make sure your pads are able to lie as flat as possible, before attaching them to the wood. Once they get attached to the wood, and stomped on, any creases in your pads might kink or pinch, causing premature failure. Get two strips of plastic hardwood floor protector (Home Depot sells 2' wide strips), each of them 6' long. Put them horizontally over the two pads. Don't bother cutting them to fit. It's easier just to fold the excess over the edge, and it helps to smooth out the sides of the wood (usually rough after Home Depot cuts it). When laying the strips, smooth out the plastic as much as you can, but don't go out of your way to strech it. If your plastic strips have a smooth side and a textured side, make a decision: choose how you want your pad to feel, and put that side face up. I prefer the textured side, to prevent slipping, and made my pad this way. Put one strip on the lower edge, covering the middle and back arrows, and hanging off the lower edges. Staple it down into the wood on all edges on the top of the wood, including the center strip (between the two dancemats). Do not staple through the dancemats! Don't worry about the part hanging off the edges for now. Put the other strip on top of that, covering the middle and front arrows, and going off the upper edges. This part is not in the FAQ on DDRFreak: Cut out the parts of the plastic that are covering the dancemats' large plastic trapezoid blocks (that have the wires coming out of them, going to the PlayStation). This is the best, because you can cover up the Start and Select buttons too, without needing to leave them exposed. Staple all edges around the dancemats, and the center strip. The plastic will still hang off the upper edge, around the trapezoid blocks, which is good, because you can later staple over the edges and this will help keep the plastic from tearing near the places it was cut. Don't staple over the edges without first stapling the main side of the board near those edges, or else you will cause the plastic to bend upward. If you're precise, you can have a slightly different texture for each row of arrows: the middle arrows will have 2 layers of plastic over them, and the front and back arrows will only have 1 layer each. You can feel this with your feet, and it helps your positioning! Use some thick tape and tape down the line where the two plastics meet (between the middle and back arrows). This is the time to go heavy on the tape here. You want to smooth out this edge and prevent the plastics from ever becoming separated. Don't leave any parts of the edge untaped. Update 7/2001: You want to make sure that you cover the entire width of the board with a long piece of tape. If you break the tape up into smaller pieces, they will chafe over time and start to ball up! I didn't do this when I first built this pad, and had to go back and tape again. In over 3 months of use, playing almost every day, this is the only maintenance I have had to do! This pad is sturdy. Update 10/2001: Finally had to do some real repair work on the pad, after six months of continuous use. The tape had balled up (see above) and was replaced. After a while, the tape lost its sturdiness and wouldn't last, no matter how much tape was put down. The only way to fix it was to do a complete cleaning. Remove all tape, and scrub the pad with soap and water. If anything is left over, it is probably adhesive gunk left over from the tape, and will need to be dissolved with solvent. I have found latex paint remover to work well for this. Once the pad is completely clean, replace the tape from the beginning, following the steps here as if for the first time. Now the pad works again like new! You should now have all plastic in place, holding the pads down securely. Both pads should be surrounded by staples on all four sides, including the center between the two pads. Go over it again and fill in gaps with many staples (they're sold in boxes of 1000+!) You should have no more than 2" between staples. Put extra staples in the empty areas near the corners of each of the two pads. If your staplegun is weak, some staples might be sticking out. Hammer them down. Whack each staple with a hammer until all of them are smooth against the plastic. Pound each staple at least once, just to make sure. You do not want to cut your shoes or feet on a staple while playing! Now, turn the board over. Fold the excess plastic tightly over the edges, and staple it down on the other side of the wood. Cut away the overlapping plastic near the corners of the wood, so that you can fold down all sides of the plastic. You don't need as many staples here, as this is just to hold down the excess plastic. 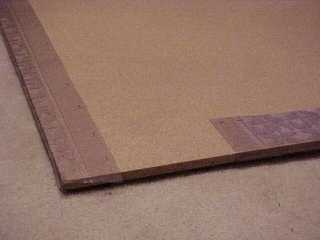 For the upper edge of the board, near the trapezoid blocks, staple the plastic down on the edge of the board, as it wraps around the wood. This will keep it from tearing. This is where rips in the plastic can easily start, so staple it very closely here (less than 1" apart when next to the trapezoid blocks). Update 11/2003: Took a year, but I finally got around to fixing Player 1's worn-out pad! I removed the old dancemat that has been in there since this pad was made (over 2½ years). 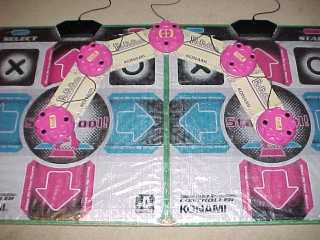 Then, I carefully installed my third Konami dancemat that I've had in storage all this time. Here's how to replace a side without disrupting the rest of the pad. Make sure your new replacement dancemat is flat. No wrinkles. Drape it over a couch for a few days, to smooth it out. 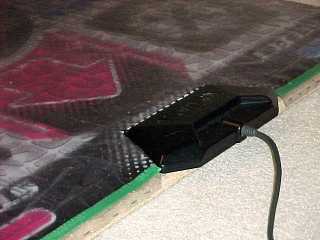 Test the mat first, with any DDR game, to make sure it works 100% and is a good replacement. Using a sharp blade such as a boxcutter or X-Acto knife, cut out the minimum amount of the plastic covering that is necessary to pull out the old dancemat. You will need to cut the plastic all along the front edge, in order to slide out the dancemat, because the trapezoid connector must come out first (any other direction would be blocked by it). Cut as far away from the old dancemat as possible. This will give you enough room to put new staples in, after you replace the dancemat. Pull out the old dancemat slowly, to avoid ripping the plastic further. Carefully slide the new dancemat into place. Make sure the dancemat stays completely flat. A good way to do this is to cut away a little of the plastic in the rear of the platform, as well as the front. This will give you two directions to pull, allowing you to tug the new dancemat into place from all sides. This will help keep it flat. Center the new dancemat. Put it into the same position as the old one. This might be hard to do exactly, since the old dancemat will most likely be flatter and slightly wider than the new one (they stretch over time as you stomp on them, causing them to be flattened out). If you have the room under the new plastic, tape the new dancemat into place. Try to tape it to the old dancemat, or to the wooden platform. This will prevent the new dancemat from sliding around on the platform. Fold the plastic cover over the new dancemat, as closely as possible. Try to remove all excess air from underneath the plastic. A good way to do this is to sit in the middle of the new dancemat, on top of the plastic cover, and use your body weight to push out the air, going from center to outside. Staple new staples into the plastic cover, in all places that you have enough room. Staple as close to the new dancemat as possible, but without actually stapling through any part of the dancemat. You will not be able to staple in all areas, because if you cut close to the dancemat when cutting the plastic cover, there won't be enough room to securely put a staple in. Put in as many staples as you can, in order to secure the plastic cover into place. Use tape to cover up all the gashes you made in the plastic, when cutting it in order to remove the old dancemat. Tape up the cover until it is as solid as it was originally, before you started cutting it. Enjoy! It should work like new again! Update 1/2013: After a decade, I have decided to retire my dancepad. It has seen many years of use, and many more years of storage. It has served its purpose well. Unfortunately, Konami has failed to support DDR by releasing new games, and so, its popularity has withered. It was fun while it lasted, though, and it helped to keep me in shape! 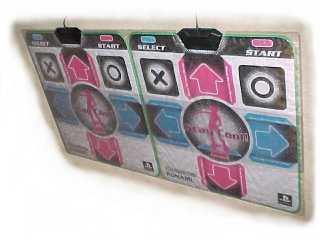 I am glad that DDR paved the way for "fitness games" to become successful. The future of games like this, which use full-body movement and unusual controllers, will be well served by the Nintendo Wii and the Kinect add-on for Xbox 360. I will miss DDR, though!